Conveniently located between the Bryce Canyon and Zion National Parks in the heart of Southern Utah's spectacular Color Country, The Iron Gate Inn is a beautiful turn-of-the-century inn that offers comfortable accommodations, delicious cuisine, and modern amenities. 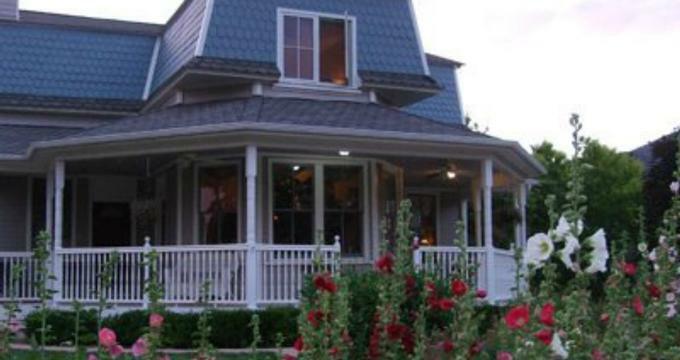 The historic 1897 Inn blends old world charm with modern-day comforts to ensure a hassle-free and relaxing stay and boasts stylish guest rooms and award-winning gardens for outdoor dining and relaxation. 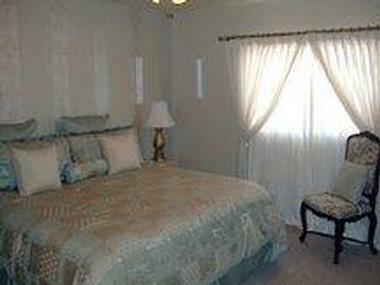 The Iron Gate Inn offers seven spacious and comfortable guest rooms decorated with period furnishings and featuring king- and queen-sized pillow-top beds dressed in luxurious linens, and en-suite bathrooms with showers/baths, plush towels, and deluxe bath products. Lovely sitting areas boast beautiful views over the gardens, and modern amenities include air-conditioning, TV/DVD players (available upon request), and wireless Internet. The Carolyn June room is located on the second floor and is decorated in vibrant hues of peacock blue and golden taupe. This room features a queen-size pillow-top bed dressed in luxurious linens and an en-suite bathroom with walk-in shower and whirlpool tub. The Carolyn June and Emma Jane rooms are separated by a hallway with a door and can be combined to form a two-room suite. Offering a romantic, garden feel with the home’s original porch posts creating a trellis over the bed, the Emma Jane room is found on the second floor. The room features buttery yellow walls, a comfortable seating area with a sleeper sofa for extra guests, and an en-suite bathroom with shower/bath, plush towels, and deluxe bath products. 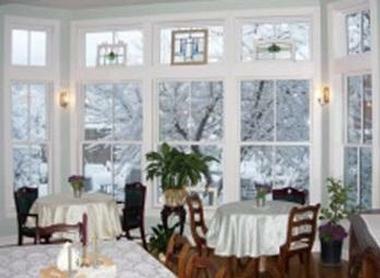 The Grace Mary room is located on the main floor of the inn and is wheelchair accessible. This tastefully decorated room is decorated in dark burgundy and soothing green tones and features large windows with beautiful garden views, a queen-size pillow-top bed dressed in luxurious linens and an en-suite bathroom with walk-in shower. The Joy Darlene room boasts a beautiful garden feel with gentle blue and green colors, white wicker furniture, and a spacious en-suite bathroom with double vanities, an oversized, walk-in shower with three showerheads, plush towels, and deluxe bath products. The Lucy Belle room is elegant and comfortable, with a king-sized bed dressed in luxurious linens, and an en-suite bathroom with walk-in shower, plush towels, and deluxe bath products. This bedroom opens onto the front porch overlooking the gardens. 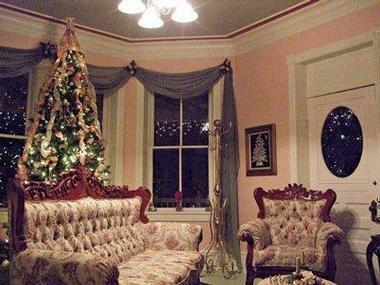 The Mattie Maple room is a charming second-floor room with garden views and is decorated in rich garnet colored wallpaper, and soft buttercream painted original pine floors. This room features a queen-size pillow-top bed dressed in luxurious linens and an en-suite bathroom with walk-in shower, plush towels and deluxe bath products. 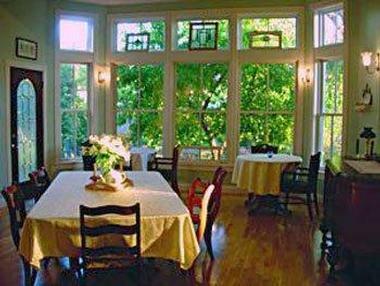 The Ruby G room is a quaint country room decorated in crisp whites and blues with views of the courtyard patio. The room features a queen-size pillow-top bed dressed in luxurious linens and an en-suite bathroom with walk-in shower, plush towels and deluxe bath products. A full gourmet breakfast is served every morning in the dining room or outdoors on the patio in the summer months. Menus change daily, but always include fresh fruit and juices, freshly baked pastries and other treats, a homemade entrée such as baked French toast, quiche or strata, and coffee and tea. The Iron Gate Inn offers amenities such as award-winning gardens for outdoor dining and relaxation, a full gourmet breakfast every morning, late afternoon refreshments served on the porch, and grounds and meeting spaces for special events and occasions. The Iron Gate Inn can be hired for weddings, receptions, retreats and conferences, or family reunions, with a variety of venues for every occasion. Offering comfortable sleeping accommodations for up to 26 people and grounds and meeting space, including lawn areas for up to 200 people, The Iron Gate Inn is perfect for family reunions and corporate or church retreats. In addition to accommodation and venues, The Iron Gate Inn also offers in-house event coordination, catering, specialty cakes and desserts, and floral arrangements. Southern Utah's spectacular Color Country offers an array of activities, adventures, and attractions, from arts and culture to outdoor recreation and more. There are a variety of arts festivals and events throughout the year, including the Tony Award-winning Utah Shakespeare Festival, the Neil Simon Festival, and live theater, live music, dance, and film. Sporting enthusiasts can enjoy skiing, snowboarding, snowmobiling, and tubing in the winter months, and hiking, mountain biking, sightseeing and wildlife watching in the summer months. Bryce Canyon, Zion National Park, Cedar Breaks and Kolob Canyon are just a few of the spectacular natural attractions in the area with stunning natural scenery and breathtaking panoramic views of southern Utah.